Living so close to the cradle of American civilization, history is fun. Trips to Jamestown. Summer camps at Yorktown.And fireworks in Williamsburg. So you could imagine my surprise when a local friend recommended the Frontier Culture Museum as the best outdoor, living history museum she’d ever visited. I decided we needed to see it for ourselves. Located in Staunton, Virginia, just a couple of hours west of Richmond, and nestled in the Shenandoah Valley, it’s one part of what might just be your perfect family weekend getaway, too. We arrived at the Frontier Culture Museum when it opened at nine o’clock.With admission fees a fraction of what they are in the Historic Triangle, we splurged for a golf cart to take us around the sprawling grounds. Having never been in one, this initially thrilled my daughters, ages nine and six, even more than the prospect of an indoor pool at the Courtyard by Marriott in Harrisonburg, where we had a perfectly lovely overnight stay. The nine-minute film in the visitor center introduces families to the Old World. On-site, there are replicas of the farms from the following countries: West Africa, England, Ireland, Germany, America (1740), America (1820), and America (1850). Being able to see all of these different cultures side-by-side is what makes the Frontier Culture Museum fantastic. The experience enables visitors to compare and contrast the daily lives of The farm-dwellers so that their eventual evolution into American culture is evident. 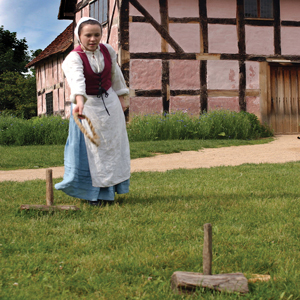 Whether sizing up architectural styles or farming methods, these authentic settings transport visitors into the past. We balanced baskets on our heads in West Africa, placed beanpoles in an English garden, and twisted wrought iron in the Irish forge. We enjoyed bowling in the yard at Germany, split wood outside the log cabin in America (1740), and spied three-day old lambs in the barn of America (1820). By the time My daughters finished cooking custard in the fireplace at America (1850), we’d been there over three hours and still, no one showed no signs of wanting to leave. While my children left marveling at how nothing was wasted – ammonia from the chamber pots prepared wool and the ashes from the fire became soap – I admired how the designers of the Frontier Culture Museum had thought of everything, from the wooden doors handcrafted by an artisan in Nigeria to the appropriate chicken species pecking for feed in each of the different country’s fields. After we explored the origins of the American people, we headed north to Harrisonburg. The city itself is small – not much bigger than Richmond’s own Carytown – and it’s in what most people would call a period of urban renewal. The city streets are clean and safe, but there are a few unoccupied buildings. However, with restaurants like the Capital Ale House now in town, I suspect the storefronts won’t be vacant long. We completed a scavenger hunt while taking in the latest exhibit at the Virginia Quilting Museum, a great blend of antique bed dressings with modern wall hangings, before heading to Explore More, the region’s children’s museum.I must admit, originally I had this on my list of if-we-have-time-for-it stops, as we’ve been to countless children’s museums all over the East Coast. It proved to be a wonderful surprise. Although Explore More is small, it’s only two years old so it’s in impeccable condition. Pieces are accounted for; everything is in working order. My daughters gravitated to the oversized Operation table, where they tried their hand at removing the funny bone, and congregated in the Farmers Market before donning safety goggles and experimenting in the science lab. By the time we headed to Union Station, a local eatery in a refurbished wheat-seed building and once the sight of the town’s railroad station, we’d worked up an appetite. While we dined, live jazz music played at the bar in the other room and we learned all about Harrisonburg’s history, as each booth is dedicated to a building that stands or once stood in town. On our way home the next day, we stopped along the scenic highway in the town of Grottoes to visit the Grand Caverns.Founded in 1804, it’s America’s oldest show cave. However, the Grand Caverns contain not only some of the most unique rock formations in the country, earning it the rank of second only to Carlsbad in New Mexico, but also signatures of Civil War soldiers. This unique blend of history coupled with the beautiful hilltop it’s perched on mean you’ll Appreciate more than just the stalactites and stalagmites in the underground formations. A Guided tour is required to explore the caverns. Over the course of the hour, our guide explained everything from the geological significance of rock color to the evolution of cave coral. She also gave us the historical context of the different rooms, such as Jefferson’s Hall, the Bridal Chamber, and the Lily Room.As we listened to her share stories of the days when the Grand Ball Room was actually used for dances, occasionally the cave would kiss us, dripping water onto our heads for good luck. By the time we posed for a family picture by the formation once mistaken for the ghost of George Washington, I felt confident these natural wonders had left their mark upon my children much in the way the water had on this subterranean wonderland. 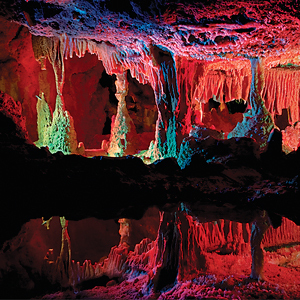 A twenty-minute video of the additional four miles of caverns discovered only eight years ago is available to view in the exhibit following the tour. The footage gives visitors a peek into the earth’s crust beyond the public tour.Watching the geologists navigate through crevices only nine inches wide mesmerized my six-year-old most. Like the geode she would later buy in the gift shop, it offered endless possibilities. Having visited other area caverns many years ago, I found the Grand Caverns much less touristy and ultimately more impressive. These stops along the Shenandoah Valley are like the caverns themselves, a hidden treasure of western Virginia. Everywhere we went the people were lovely and the crowds were simply nonexistent. From the knowledgeable staff at the museums to the pleasant volunteers at the front desks, I feel completely confident sending Richmond families here – even though it’ll mean it won’t be a secret anymore. 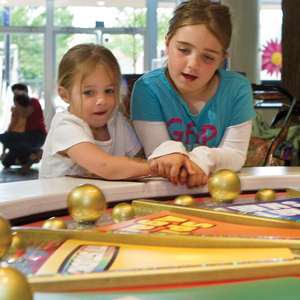 If you’re checking out Harrisonburg’s Explore More Discovery Museum, here are five family-friendly Saturday activities right around the corner, part of Harrisonburg’s Family Fun Saturdays. Art in the Park – New venture by the Arts Council of the Valley. The name says it all-bring children to create art in the park. Free entry. Harrisonburg Farmers Market – Local producers of vegetables, fruits, meats, jewelry, jams, breads, & much more! Free entry. 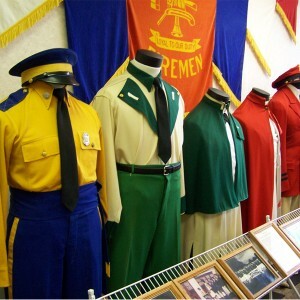 Harrisonburg Fire Department Museum – Free Entry. Massanutten Regional Library – Next door to children’s museum, free entry.